Currently I am in the midst of administering the DRA to 60 first graders. It is taking just a little bit of my time these days. With our data, we will be creating our first grade RTI groups. We made our kindergarten groups today, so we are getting somewhere! I am definitely ready to be done testing and to get moving with these groups! Once you start dreaming about the DRA, you know you are in trouble! Since I am wrapped up in testing, I decided to share one of my favorite techniques for teaching summarizing. It is such a simple idea, but the kids really love it. I believe it is extremely effective as well. The lesson is based off of an idea I found in one of my favorite books of all time, Strategies that Work by Harvey and Goudvis. To begin, I selected two texts about the Dust Bowl from EBSCOhost. 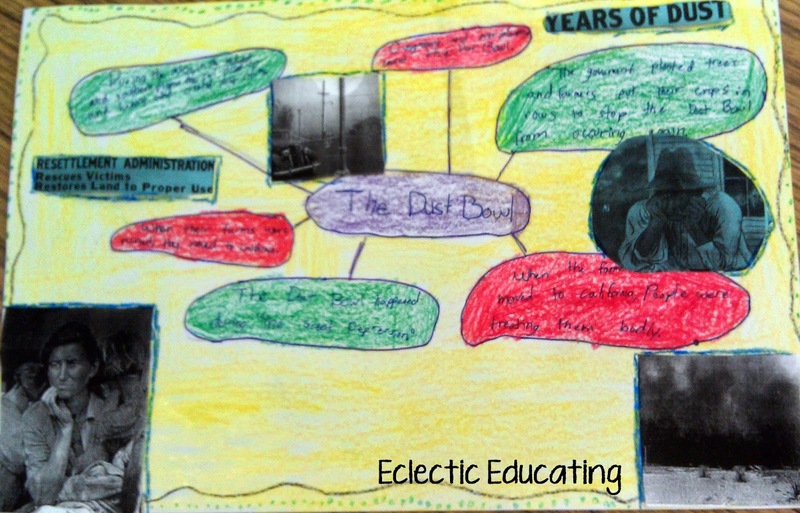 Both articles had a variety of great text features, including detailed photographs, vocabulary boxes, diagrams, etc. In order to make the summary webs, it is important to chose an article with several visual text features, particularly photographs or diagrams. 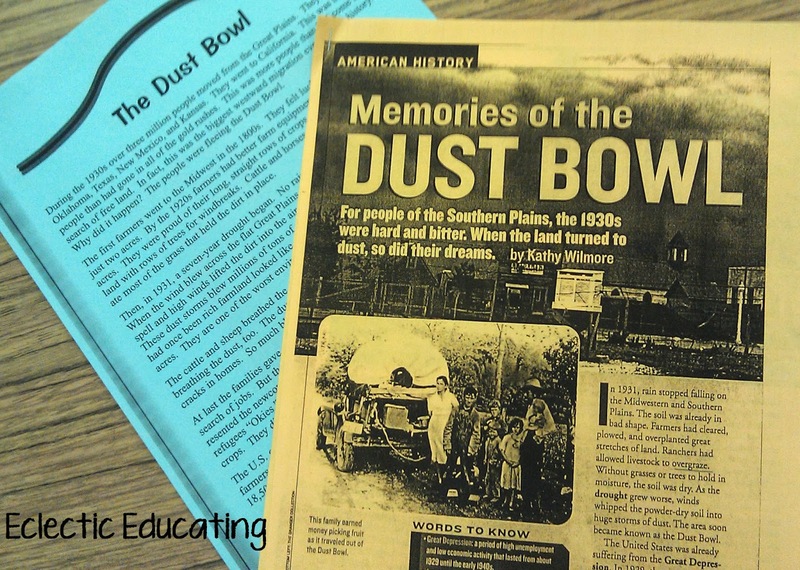 Students read through each text independently, and we discussed our reading and what we had learned about the Dust Bowl. 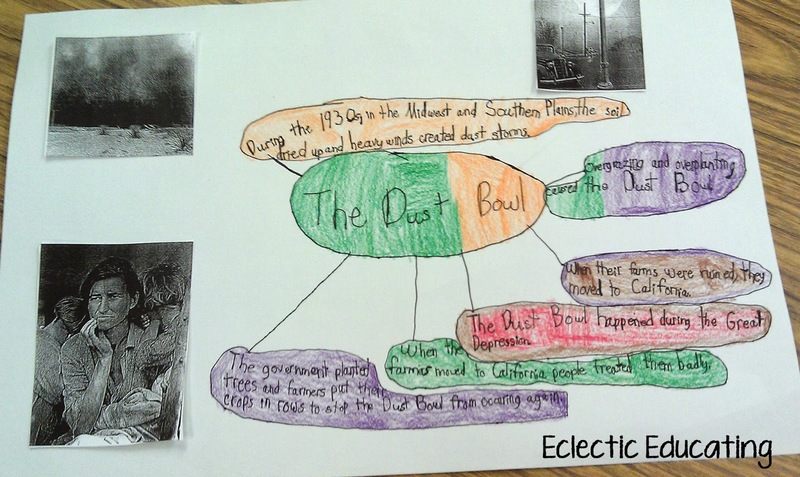 Many students had a basic understanding of the Great Depression, but had not heard anything about the Dust Bowl. They found the dust storms fascinating. In such a developed part of the country with so many buildings, they had a hard time wrapping their head around the actual reasoning behind the storms. As students read, we worked on taking notes on the important information using our reader's notebooks. Students then used these notes to complete a summary web of the two articles, essentially synthesizing all the information they had gathered on the Dust Bowl. To really enhance the project, I printed off some extra images from the articles, as well as additional images from the Library of Congress. You can find image collections from almost any major event/era in history on their website. Overall, I find summary webs to be a great way to get students to synthesize information from different sources. Students don't really see the project as writing a summary, and as a result, are more involved and motivated. Does anyone else make summary webs? What topics have you covered? That seems like a good lesson! I'm always looking for ways to spice up guided reading! I too am excited to finish up reading assessments so I can group my students and move on!! I love your summary webs. I love all the ideas for finding non-fiction articles that people have been sharing - thanks for sharing yours. I love your idea of summary webs, I haven't used them before but I am going to give them a try. Thanks for sharing!